Filing your Form 2290 for Heavy Vehicle Use Tax (HVUT) can be time consuming and confusing. The IRS has simplified this process by introducing the ability to E-File your Form 2290. Now that you can E-File, you can complete the process within minutes and you have an online record of previous returns right there at your fingertips. ExpressTruckTax is an IRS Authorized E-File Provider that makes this process even easier with their friendly US based customer support team who is ready to eager to lend a helping hand if necessary. The program is very easy to use, even for those who are not too comfortable with a computer. This tax is due every year and must be paid in full and on time or you will be assessed penalties and interest. The penalties for filing late will not be imposed if you can show reasonable cause for not filing on time. The penalty for failing to file IRS Form 2290 in a timely manner is equal to 4.5 percent of the total tax due, assessed on a monthly basis up to five months. Late filers not making an HVUT payment also face an additional monthly penalty equal to 0.5 percent of total tax due. Additional interest charges of 0.54 percent per month accrue as well. The August 31st due date is approaching so E-File the Form 2290 online now, go to ExpressTruckTax.com. If you have any questions, contact our friendly US based customer support center in Rock Hill, SC at 704-234-6005 or email us at support@ExpressTruckTax.com. Unless you enjoy IRS Audits and spending time in courtrooms, it is a terrible to not pay your taxes. The IRS can add all kinds of interest and late fees, but if you end up in court over the matter it will lead to the court costs as well as heavy fines. Fines are bad enough, but it could be worse. Going to court can lead to criminal charges. The IRS & state governments could prosecute anyone who purposely cheats to avoid paying the truck tax. It can also lead to time in prison. If these are not paid in a timely manner, the previously mentioned fines, court appearances, and possible jail time could seriously put a halt on your business. The time and energy spent worrying about IRS Audits, Fines, and Court Dates is not worth it. Especially when the taxes are not typically very high. Paying taxes is never a joyful experience, but you should get some gratification in the fact that much of the taxes paid for HVUT go back into the cost of roads and highway expenses. It just makes sense; if you enjoy using something, you shouldn’t mind paying for it. With Express Truck Tax, their team of Truck Tax experts will guide you through the process. All you need to do is login to www.ExpressTruckTax.com and start entering the vehicles that you need to file for. If there are any questions, you can call them at 704.234.6005 or send an email to support@ExpressTrucktax.com. 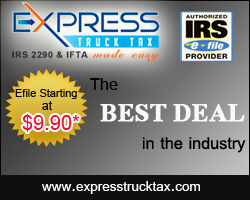 E-file IRS form 2290 with expresstrucktax.com on time. It’s made as easy as 1-2-3 to e-file truck tax 2290 and get IRS stamped Schedule 1 in few minutes. Avoid IRS penalties and Audits by keeping your 2290 records with express truck tax. E-file IRS 2290 VIN Corrections for free of cost. The term IFTA refers to the International Fuel Tax Agreement. This agreement makes certain vehicles liable for a Fuel Tax for each state in which the vehicle was driven. IFTA is a tax collection agreement among the 48 contiguous United States and the 10 Canadian Provinces bordering the US. Recording and Organizing the information required is a very precise and exacting task, but thanks to Express Truck Tax, there is now a much simpler web-based process. Vehicles required to prepare an IFTA return must keep track of miles traveled and fuel purchased within each state or province. Due to the complicated task of keeping accurate records, and filing this form appropriately many less than fortunate drivers receive IRS audits because information on their IFTA return was not properly entered. As mentioned earlier, Express Truck Tax, along with providing a terrific service for other Truck Tax needs IRS Form 2290, will perform an internal audit of your information for you. In this internal audit performed by Express Truck Tax, it will check for basic mistakes and discrepancies, as well as perform a state adjacency check and an abnormal MPG audit. They also provide online trip sheets for drivers to keep accurate records that can be accessed from any computer, anywhere! If you can prevent an IRS audit due to simple mistakes on an IFTA return, it makes no sense not to. Let Express Truck Tax help get it right the first time. The Internal Revenue Service recently advised truckers and others filing Heavy Vehicle Use Tax that the next federal highway use tax return would be due on November 30, 2011instead of the typical August 31 deadline. The full letter from the Internal Revenue Service can be found here. The extension is meant to remove confusion and multiple filings. Since new legislation needs to be voted on by Congress, the tax could be modified or simply reinstated. To ease the hassle of applying for state vehicle registration on or before November 30, state DMV’s must accept a stamped Schedule 1 of the prior year’s Form 2290. Typically, taxpayers receive a stamped schedule 1 after the Heavy Vehicle Use Tax is filed and paid. However, this year, the prior year’s schedule 1 must be used because the IRS is not yet accepting the Form 2290 for this tax year. For Taxpayers who have acquired and need to register new or used vehicles during the July-November period, new regulations now require states to register those vehicles without a proof of HVUT payment. The taxpayer will be required to prove that they acquired the vehicle within the past 150 days. For taxable vehicles used during July, the Form 2290 and payment are normally due on August 31st. The tax is calculated based on the weight of the vehicle. There are also many special rules that apply to vehicles with low mileage, as well as logging, and agricultural vehicles. If you are required to pay Heavy Vehicle Use Taxes (HVUT), you must file the IRS Form 2290. If you have been paying these taxes for many years, then you know that this form has historically been filed by paper. However, there have been some huge technology advances in the past few years and the IRS does now accept and encourage taxpayers to E-File their 2290 Form. The IRS has certified several 3rd Party Service Providers to E-File the Form 2290 on behalf of those taxpayers who need to file. The IRS itself does not provide a way to E-File this form through their website. In deciding how to file, there are a few things that you should consider. When you select a provider, it is important to be sure that they are an Authorized IRS E-File Provider, make sure that they can handle all of your truck tax needs, and it is safest to find a provider that is entirely web-based. When selecting an Authorized E-File Provider, you should look on their website for something to verify that they are actually authorized by the IRS to E-File tax forms. You can also refer to the IRS Website to see a complete list of Authorized E-File Providers. If you are filing several types of Truck Taxes and not just the Form 2290, such as IFTA, or Form 8849 then it would be helpful to have them all filed from the same place. Some service providers are exclusively for Form 2290, or Form 8849, etc. The most convenient and economical way of filing would be to have them all filed from the same service. The benefits of a web-based system are indeed numerous. If an E-Filing system is not web-based, then there is less reason to use it. The IRS recommends E-Filing because of it’s speed and security. If you are required to download lots of files and store information on your computer, your system is not completely web based. The benefits of a web-based system are obviously the speed of transfer to the IRS when you are finished, but also the security of storing your information online instead of on your computer. If you rely on your computer to store your information, you run the risk of losing all of your information if your computer crashed or if you spill something on it, etc. ExpressTruckTax.com fits all of these qualifications for a Truck Tax E-File Provider. It is entirely web-based, they are a one-stop-shop for truck tax needs, and they are authorized by the IRS as an official E-File provider. If you need any help, you can also contact their wonderful, Customer support team! They offer live chat & phone support Monday through Friday (9:00am - 6:00pm EST), as well as email support 24/7. This way you can get a stamped schedule 1 in about 10 minutes. The file is electronically submitted to the IRS, and within minutes the file is processed by the IRS and sent back to the person filing.